As a business professional, it’s high time you raised your online profile on LinkedIn to build industry influence, amplify your brand, and drive significant opportunities and business success… because everyone else is, including your competition. 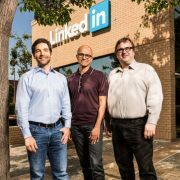 LinkedIn is a critical means of communicating personal and business brands to the world, and a goldmine of opportunities for those who fully use their profile to reveal industry authority and promote executive expertise. Your personal profile is the cornerstone of your efforts on LinkedIn and should be leveraged to communicate your brand and showcase who you really are. So, whether you’re building a brand, looking for a new career opportunity or simply wanting to stand out and get noticed as a senior executive, follow these four simple steps to better leverage your profile and drive greater online results… fast. Connecting with people on LinkedIn is important and the most effective way to build your senior executive network to develop high-quality relationships that will deliver opportunities. However, while it might be tempting to connect with as many people as possible and grow your burgeoning online network to epic proportions, quality always trumps quantity when it comes to LinkedIn. Build your network over time but try to do it strategically, ensuring your connection requests are targeted and of value, personalising the connection requests as much as possible, and giving something of value to that potential new connection – it’s important to be generous on LinkedIn and offer your help, rather than make demands or give the hard sell upfront! An optimised LinkedIn profile builds trust and makes people want to engage with you. It’s your digital business card and an ideal opportunity to strengthen your personal and professional online presence. Everything on your profile should contribute towards your overall brand, offering a unique story about who you are and the kind of work you specialise in, where you’ve come from, what your mission is (in work and in life), the pain point your target market is facing and how you can help fix their pain, plus any tangible successes you’ve had and results achieved. Include multimedia to show your work in action, such as speaking gigs or roundtables, and optimise your profile with relevant keywords, particularly in the headline, to rank at the top of LinkedIn searches and get found by people looking for influencers and authority figures like you. While writing and publishing your own work might sound like a terrifying superhuman feat in terms of time and ability, it’s actually quite easy to do and is a great way to showcase your knowledge and build credibility as a thought leader or the ‘go-to’ person – someone that matters to the online conversation. By contributing useful, interesting and memorable content to LinkedIn on a regular basis, you can spread your message far and wide, and be recognised for your leadership and subject matter know-how. What’s more, the blog post sits on your LinkedIn profile for future visitors to see (visitors who could potentially become customers) and is searchable both on LinkedIn and on Google, giving you a boost in search visibility, visitor traffic, and relevant referral traffic when using calls to action to link back to a website, white paper or other entry into your sales funnel. Getting results from LinkedIn isn’t just about establishing a powerful profile. Once your profile is complete and fully-optimised, you need to get active on the platform to get noticed for the right reasons. Social proof is evidence that you are who you say you are and that you’re a credible, knowledgeable business contact to be associated with. It’s therefore crucial to build that social proof as you go about your business on LinkedIn and grow personal relationships that could turn into business leads. The general rule of thumb for any CEO or business leader is to remain active on the platform by adopting a regular routine, whether daily or weekly, long or short. Try to regularly share links of interest (latest news, current thinking, and more) to your contacts and others in your industry, join relevant groups and actively engage in group discussions, and of course frequently update your profile with new endeavours and tangible achievements. With LinkedIn, it’s key to stay top of mind with your growing network. Leverage your executive profile by keeping it up-to-date, by publishing content and networking strategically, and by actively engaging in conversations and groups to position yourself as the acknowledged expert and trusted authority in your field. LinkedIn is the preferred social network for CEOs, with eight in ten CEOs engaged online and via social media. LinkedIn usage is highest among those with an annual income greater than $75,000. 93% of companies use LinkedIn to fill positions, including at the CEO-level. Seven out of 10 professionals consider LinkedIn a trusted source of professional content, making it important that your message reaches the right people. Having a professional LinkedIn photo makes your profile 14 times more likely to be viewed. 2018 is upon us and it’s high time you got out there and raised your digital profile to build industry influence, amplify your personal and business brand, and drive opportunities and success as a C-Suite Executive. Sarah Ward is the Training Director at The International Writer, a content writing and training company creating powerful online content and providing customized LinkedIn and business writing training to boost a personal or business brand, build authority, and drive influence. We’ve all done it. Shared the update we immediately regretted. Put up a profile photo that wasn’t quite right. Invited someone to connect without tailoring the invite and got an abrupt “Who are you and why are you trying to connect with me?” response. Classic LinkedIn etiquette mistakes. While some of these faux pas may not seem all that bad, others can be damaging to your online reputation and career aspirations if you continue to make the same mistakes over and over. LinkedIn continues to evolve at a rate of knots and it can be tough to keep up with the many updates and modifications. But one thing remains consistent: the basic, common sense principles of old-fashioned etiquette will always apply. LinkedIn is a professional social platform that you should interact on as you would in a real-world, face-to-face setting. So whether you’re building a personal or business brand, looking for a new job or simply wanting to nurture a burgeoning online network, try to avoid these five etiquette fails that could make you look unprofessional and out of touch. While it’s tempting to sit on your smartphone and invite everyone on your ‘People You May Know’ list to connect, it will come across as spammy and verging on the socially weird. Of course, reach out and connect with a wide range of people to build your network over time, but do it skillfully, have a reason for doing so, and with something valid to offer that potential connection. It might be that you saw something they wrote and you wanted to connect to take the discussion further. Maybe you work with somebody who recommended a mutual connection. Perhaps you share a past career experience or cherished client. There’s nothing wrong about connecting with strangers, but try to make sure your requests are targeted and of value – and personalise them as much as possible to make the recipient feel more open to the invitation. When you update your profile, a notification is sent out to your network advising them that a change was made if you leave your network notification setting turned on. This can be a great way of informing people that you’ve changed role or that something significant has happened to your business or career – and it can lead to increased profile views, which is no bad thing. Where the updates fall apart are when you don’t turn the setting off and start to fill your network’s feed with constant notifications of new positions, new schools, new headlines, new everything. But these things aren’t often new – you might have simply changed a word or phrase here and there, but your network is being bamboozled with the updates. You’ll start receiving endless “Congrats!” from people about some minor change and you could be informing employers of potentially damaging career updates. As with any social setting, nobody likes to be pestered. What’s more, nobody likes to be pestered when they have only just met you. To be admired and respected, you need to be authentic in your approach to your network and the actions you take on a regular basis. For a start, don’t ask people to endorse your skills and never tell them that you’ve endorsed their skills so they should now endorse your own. It’s just plain creepy. When it comes to your network, don’t make connections just to get hold of an email address so you can then bombard them with marketing messages. It’s called permission marketing for a reason and a LinkedIn connection doesn’t equal permission to send marketing emails, ever. Finally, never, ever, ever send messages confessing your passionate interest or undying love for a new connection. It happens. It horrifies me. It isn’t Tinder. Please stop. As LinkedIn grows, so do our inboxes. Sometimes you’ll receive a message that adds value to your life, but often it will be a random series of paragraphs that make little or no sense to your work or life. What’s worse is when you thank someone for connecting with you and they immediately hit you up with a sales spiel right out of the local car dealer sales handbook. It feels plain wrong. If your goal is to target sales professionals in the textiles industry and you want to reach out to 50+ people in your network then, of course, you’re going to create a message template that you can use for each message. And we get that. But try to personalise each message you send to the extent possible. Study the person’s profile and look for the ways in which you can authentically start a dialogue with them. Include a shared reference, something that brought you to this person, even a comment on an article they may have recently published. Whatever you send, make sure it is tailored, relevant and of value. And never send group sales-focused messages – you’ll enjoy a string of angry responses if you do. With so much content out there to share, it can be tempting to publish everything and anything. LinkedIn is a social network and we are supposed to be sociable on the platform, but it is a professional network where the etiquette rules are quite different to the likes of Twitter or Facebook – in other words, keep the overly-personal shares out of this space. You also need to watch the frequency of your posts or you’ll run the risk of being seen as a nuisance. Whether it’s a blog post or news feed update, you should always have a strategy in the back of your mind for posting and a schedule that doesn’t overwhelm or infuriate your audience. Try to avoid posting more than one newsfeed update per day and carefully consider the kinds of updates being shared – are they relevant, interesting, unique and shareable? Tick these boxes and you’ll be well on your way to influencer status. It’s not all bad and there’s hope for us all. LinkedIn doesn’t have a firm set of rules when it comes to good etiquette and much of what I’ve mentioned is common sense. Rather than run the risk of infuriating your network, connect with people you know, or you can offer value to and build a healthy relationship with. Ruffle feathers no more by updating your profile on a regular basis, but by selectively switching the notifications on and off as appropriate. Placate any pet peeves by behaving in a non-pesty kind of way – endorse those you know and respect, never bombard with emails, and look elsewhere for love. Beat the angry responses by tailoring your messages and connection invitations in a personal yet professional way. Instead of frustrating, excite and appeal with high-quality content that is shared once per day and is relevant, of interest and doesn’t waste your readers’ time. LinkedIn is an incredible networking resource so make proper use of it without upsetting your network and hurting your brand. What have I missed? What other etiquette rules are there or what behavioural annoyances would you include on this list? It’s hard to believe the end of the year is already fast approaching. Are you close to achieving your career goals? Are you hitting your numbers and enjoying better business results? If not, there’s still time to market yourself on LinkedIn and enhance both personal and business brand with a professional LinkedIn makeover. Wherever you are in the world – whether it’s time for a Spring clean or an Autumn clean-up – The International Writer is offering a 10% discount on our best-selling LinkedIn Profile PREMIUM Package until October 31*. Just use the promo code – 10percentoff – when you order the LinkedIn Profile PREMIUM package here to take advantage of this offer and work with me, one-on-one, to stand out and drive opportunity. *includes complete LinkedIn profile rewrite, brand questionnaire, phone interview, one-hour online Review & Strategy session, plus 30 days of email support. If your goal is to improve your online presence, as well as that of your business, and establish yourself online as a thought leader – to show authority and drive influence within your industry – then LinkedIn is an ideal place for promoting your personal brand and networking with your peers. One of the best ways to showcase knowledge and expertise is by publishing blog posts on LinkedIn’s blogging platform – or Pulse, as it’s now known. A social hub for professionals looking for professional advice, you can use Pulse to drive a focused business readership to your thought leadership efforts. The advantages of using LinkedIn Pulse are that both your connections and followers get to see your published posts and often the reach is greater than on any business blog – plus you can drive traffic to your business website through web links and calls to action. Engagement can shoot up through comments on posts, giving you the chance to take the conversation with commenters offline and grow those relationships. Pulse is a great way of showing who you really are and building your profile – you become the trusted advisor who has something useful to say. But here’s the problem – what if you’re not a writer or blogger and don’t know where or how to start? We’re all told that we need to write more content to boost our profile, but what if you have a phobia of writing? What if you’ve never published anything online before? How do you know what to write and whether your post will be any good? Our worst fears might be realised if we publish something terrible and end up looking like an idiot rather than expert. First, you need to understand why you want to blog – is it to increase brand visibility and promote your business to a much wider audience or do you have something important to say? While most people share updates and some will have a go at improving their profile, taking that first step to blogging is a whole new ball game. The key is making a commitment to sharing your know-how, then following it through. Once you figure out your purpose for blogging, make that decision to get started. What are you going to talk about and how often you going to say it? Are you going to write about an aspect of your industry, which might appeal to a niche market but probably won’t drive significant reach, or are you going to write on broader topics – sharing your many years of business experience on topics such as employee communication, sales excellence and project management hacks? A combination of both is best – and a focus on quality, insightful writing that will start a conversation. Always repeat the mantra – is it useful, interesting, audience-friendly and unique? Aim to write fortnightly to start with, then adjust based on audience response and your own workload. There’s nothing worse than writing for the wrong audience – they won’t respond and your post views will tank. Determine your ideal reader (customer, colleague, employee?) and ensure your blog posts are professional and business-focused. If you plan to write for your peers, show them how they can get better at what they do. If you’re writing for clients, current or potential, don’t give them the hard sell – talk to them about the issues they face and ways to fix them, whether it’s through the work you do or not. Give them business advice and industry updates or insights first. If you’re time poor or inexperienced at blogging, then it makes sense to engage a content writer. A professional will work with you to develop your thought leadership ideas, draft the articles in line with preferred style and voice, while using relevant keywords, catchy headlines and appealing images. A professional will also edit and proofread the piece, then publish it for you on Pulse. This not only frees up your time for the work of running your business but ensures that someone with digital content skills can get your first few blog posts off the ground. Once a content writer has published a few posts for you and you’ve been part of the content creation process, seen how it’s done and figured it out, then it might be time to try writing a blog post yourself. With increased confidence and a growing audience, you can build on the work of your contracted writer and start to write from the heart and with conviction about issues and topics that matter most to you and to your reader. If you’re ready to promote yourself as a true industry expert and start blogging online, LinkedIn’s Pulse platform could easily be the best way to maximise your online efforts to drive visibility and customer engagement – and all with fairly minimal effort. If you’re still unsure where to begin, let’s have a conversation about getting you started blogging on LinkedIn today. The point of being on LinkedIn is to get noticed and make connections, build your network and then choose how you want to work that network – seek a job, do business or build influence, among other things. Getting noticed requires you to have a powerful, persuasive profile – one that tells a story about who you are, what you do and how you can help me. Getting noticed also relies on active engagement and, for many of us, this means searching other people’s profiles and company pages for potential business connections or job opportunities. When you do this, you’ll start to see the number of views to your own profile grow as people return the favour. Before you know it, the connection requests increase and the inbox messages grow – and all because you looked at a bunch of profiles. I market my own business by exploring contacts I think could become customers. I view their profiles before reaching out to make the connection, either via a request or InMail. That’s the thing about human behaviour – when someone sees that you’ve stopped by, they look back out of curiosity and investigate who you are. It’s a “you looked at my profile, now I’ll look at yours” thing. And, BOOM, you’ve got them. Because your profile is of course fully optimised with a killer headline and compelling summary revealing your experience and the ways you can help them – your products and services. Before you know it, a message or email follows because they like what they’ve seen and they want to know more. There’s nothing weird about revealing your profile to a person you’ve visited on LinkedIn. It’s how the platform works, otherwise why else would we have public profiles? Imagine contacting a company about a possible job and you see their CEO looking at your profile only days later? Or sending an email to a potential client then you find one of their staff checking you out? You get a better sense that they’re interested in you and it might drive you to follow up. But it’s all a waste of time if no-one can see what you’re doing in the first place. If your profile viewing actions go unnoticed. If you’re getting little or no response. Ever wonder why your profile views stutter? Your profile ranking fails to climb? Ever wonder what you did wrong? Here’s the thing. You probably made the one LinkedIn setting mistake they never told you about – you forgot to turn on your visibility in the account settings. You might as well not even exist. You left your profile settings on ‘anonymous’ and nobody knew it was you looking at their profile. The default on LinkedIn is that your profile information isn’t shared with other people when you look at their profiles unless you want it to be. However most of us are interested in growing our personal brands and actually WANT this information to show when we visit other profiles. You need to change your visibility settings fast and reveal your photo, name and headline so others can see that you’ve viewed their profile. It’s easy enough to do. Go to your Account Settings in the top right corner of your profile. Select Privacy & Settings: Manage. Click on ‘Select what others see when you’ve viewed their profile’. Select ‘Your name and headline (recommended)’. Save changes and you’re done. You need to ensure your LinkedIn settings fit with your business and personal goals. One way to achieve this is to become more visible on LinkedIn to make you more effective and better positioned for future success. So change those settings today and don’t make the one LinkedIn mistake that could cost you in the long run. As part of our LinkedIn Influencer Profile Writing Packages, we check to make sure your settings fit your purpose for being on LinkedIn. We help you show up as an expert or authority in your field – and get noticed fast. Get in touch at hello@theinternationalwriter.com to learn more.